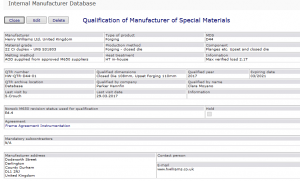 Full TR2000 Listing for NORSOK M650 - Henry Williams Ltd.
As promised back in May the final part of our NORSOK M650 approval has now been completed and we have been listed on the Statoil website as a manufacturer of special materials or the Tr2000 list as it is known. This approval enables us to produce DUPLEX forgings both in drop and upset forged geometry to service our Oil,Gas and Energy customers, and we are now working on further NORSOK approvals in Duplex and Alloy steels. This compliments our offering for all forgings, in particular in the flow line and instrumentation valve market, and validates our competency to manufacture and supply high quality Duplex forgings in house including all the relevant tests and certification. With drop and upset forgings from a few grams to 140kg we can provide short leadtime forgings from Western Europe raw materials to your exacting designs and specifications plus and extensive range of stock single and double flange forgings on a next day delivery basis.